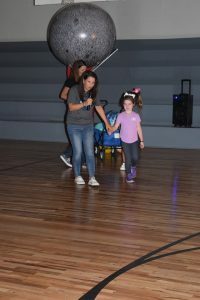 Free Home Elementary Brings in Orbit Earth Expo! 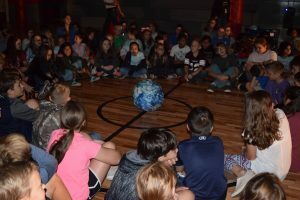 CANTON, GEORGIA – Orbit Earth Expo blasted into Free Home Elementary! Ginny and Stephanie had a blast teaching the kindergartners all the way through the 5th graders. The Free Home gym is always one of our favorite spots – one of the darkest in the area! We love when it’s dark because we can make the greatest shadows, allowing us to demonstrate solar and lunar eclipses, plus phases of the moon! Our favorite question of the day was “What would happen if the earth stopped rotating?” Wow! That really got us to thinking! Would one side of the earth always have nighttime? What would happen to the plant life? The questions kept coming! 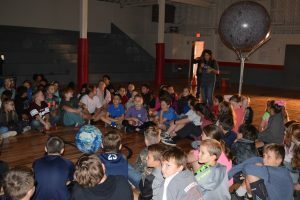 We had a good time with all of the grades and students continued to ask great questions and share fun facts – an interesting fact that came up while we were talking about why we can’t bring the right size sun model to go with our 14′ earth model was from a student! Did you know the sun is getting bigger every year? Nice job, you’re right! Here’s why: Because the Sun continues to ‘burn’ hydrogen into helium in its core, the core slowly collapses and heats up, causing the outer layers of the Sun to grow larger. This has been going on since soon after the Sun was formed 4.5 billion years ago! Thanks, Free Home, for a fun day of Orbit Earth Expo! Thanks also to Ms. Hagood for the pictures and Ms. Comelitti for the hospitality! 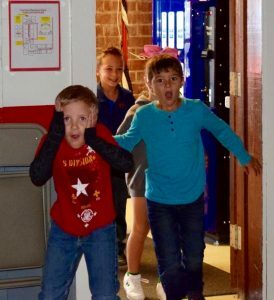 Your school is always such a great experience!